Are you a Kristin Hannah fan? I am! Today, I’m reviewing her latest book, The Great Alone, and, for a special twist, I have a giveaway to celebrate this novel! 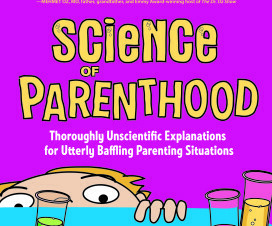 Disclosure: I partnered with St. Martin’s Press on this book review. All opinions included here are my own. See my disclosure policy here. Nearly 20 years ago, I went on a vacation to Alaska with my family. It was our last trip together before my father passed away, and I very carefully hold the memories of that time in my heart. The journey north was my parents’ doing; Alaska was on their travel bucket list. I remember having work commitments that almost prevented me from going along, but in the end I went, and it was unforgettable. It was an adventure I am grateful I didn’t miss. Alaska is stunning. It’s a place where nature dominates and where people must learn to survive, or else. My family visited during the summer, when the light seemed to last forever and when the land pulsated with possibility. One of my favorite parts of the trip was taking a small plane over Denali National Park and up around the peak of Denali itself (also known as Mount McKinley, North America’s highest mountain). I can still remember—even after all these years—the sound of the engine whirring and the majesty of the icy mountain out the window, tall, gorgeous, and proud. I understood—a little bit at least—how someone could fall in love with this dangerous and otherworldly place and want more than anything to call it home. 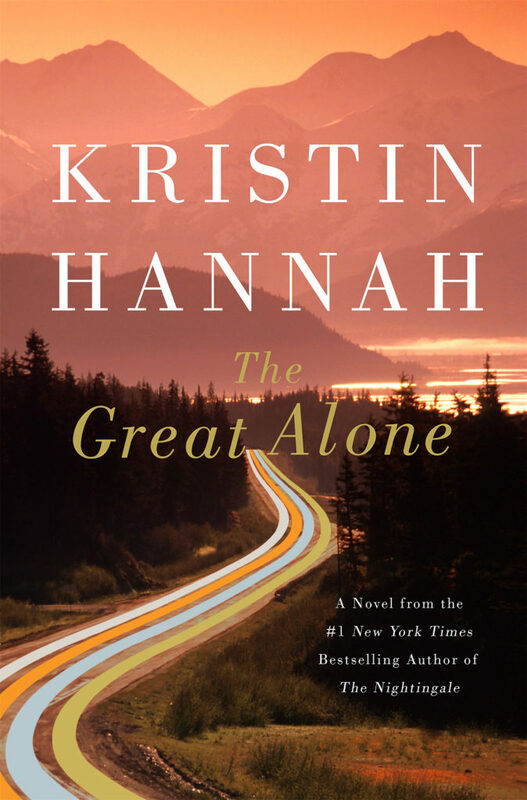 New York Times-bestselling author Kristin Hannah has made Alaska the backdrop of her latest novel, The Great Alone , which follows the story of a thirteen-year-old girl, Leni, who moves with her parents to a cabin in the Alaskan wilderness with the hope of creating a new life. Her father, Ernt, a volatile POW who barely survived the Vietnam War, seeks refuge in Alaska’s untamed frontier where he can live off the land and escape the pressures of civilization. Leni and her mother Cora, at first, are thrilled with the beauty of Alaska and are drawn to the warmth of the people they meet who offer them support and hospitality as they adjust to their new life, one for which they are very much unprepared. As winter approaches, however, isolation and darkness become too much, and Leni’s father’s mental state deteriorates. Leni and Cora are no longer safe, and are forced to make a drastic choice. From page one of The Great Alone, I was immediately transported to 1970s Alaska where living off the grid was commonplace and where a pioneer spirit drew people to the harsh, yet captivating, landscape. Kristin Hannah is so skilled at effectively grounding the reader in her story’s setting. She grew up in Alaska, and brings her love for this special place to the pages of The Great Alone. From detailed descriptions of how to protect oneself against a bear attack, to how spring in the wilderness appears suddenly and with great brutality, to the charm of lupines blooming in a meadow, Hannah delivers to her readers a vision of Alaska that fills her heart. It is a place where death is always present, and where life imbues every corner and crevice. I’ve read two other novels by Hannah—The Nightingale and Winter Garden —both of which I recommend. (Each left me sobbing at the end.) The Great Alone shares an important characteristic with each of her previous novels: they are all grounded in the relationships that drive our lives, whether it is sister to sister, husband to wife, mother to child. The relationship of Leni and Cora—“two peas in a pod” as they describe themselves in the book—is one that gives them both courage to survive Ernt’s abuse, and ultimately, to make choices to protect themselves. Recommendation: Put this on your to read list, if you’re a Kristin Hannah fan, and have Alaska on your “to travel” list. Pack The Great Alone in your suitcase for your next big adventure! And, of course, we can’t forget the The Great Alone giveaway! Thanks to the folks at St. Martin’s Press, Red Shutters readers can enjoy this novel with all the trappings of a cozy evening with nothing on the agenda but falling into a great story. 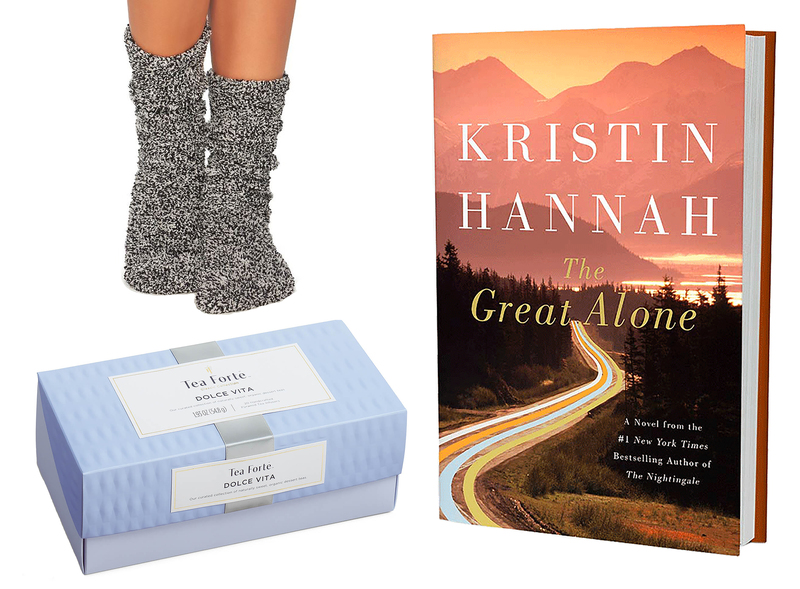 Enter this giveaway to win a copy of The Great Alone, a pair of cozy socks, and a Tea Forte tea collection–perfect for cuddling up to read Kristin Hannah’s new book! Those entering the giveaway must be over 18 years of age and residents of the United States. 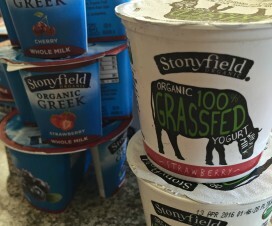 This giveaway ends June 27. Follow the link below to enter. 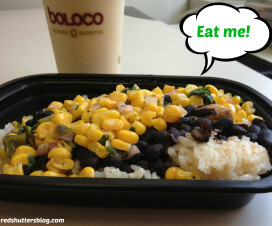 We’re cooking with Boloco and Nasoya! I’ve never been to Alaska. I’d love to visit Hawaii or Australia someday. Thanks. I’ve never been to Alaska! I would love to go to Italy! I have never been to Alaska, but I have always wanted to visit. I also want to visit Iceland someday. I have never been to Alaska, BUT – In january my older sister moved to the Homer area so we will surely be doing a girls trip up that way sometime soon. (She keeps posting videos of the moose in her front yard, it’s insane!). My true dream trip, however is Italy. The food. The wine. The men with Italian accents. Not entering the giveaway because I own this book and am reading it now. I am LOVING it!